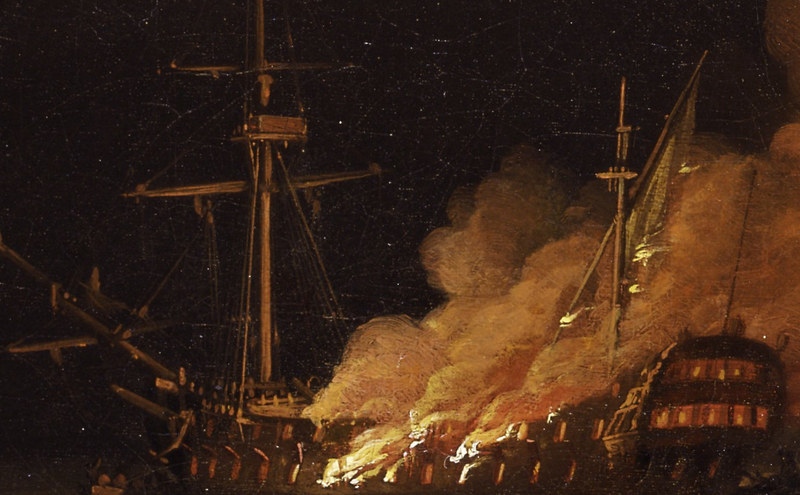 Ship on Fire at Night, Charles Brooking, 1756, Yale Center for British Art. The eponymous ship on fire is a big one. She's lost her main and her mizzen top. Fire is already pouring out of her gunports. Given the fighting tops and the impressive rows of gunports, the vessel was probably built as a warship. There is no guarantee that she is a warship. Men of war were often sold and converted into merchantmen at the conclusion of a conflict, or if they were dimmed unfit for the naval service. Whether she is a warship or a merchantman, she certainly won't be doing anybody any good from here on. The conflagration is consuming her quickly. Despite the danger, her crew are doing their best to unload the cargo. It could be that they are trying to avoid an explosion. 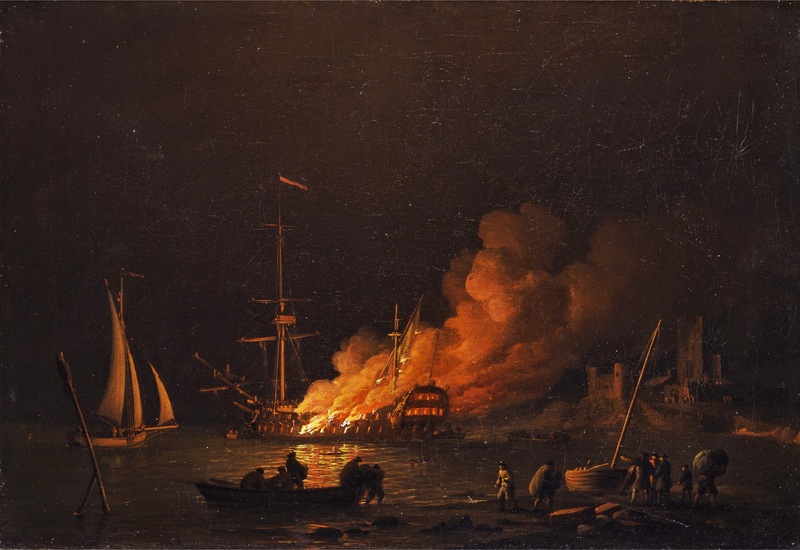 Fires at sea could easily spread to a magazine and destroy the vessel, sparking more fires on neighboring craft. Sailors whose vessels sank or were severely damaged by the elements frequently claimed salvage rights as defined by vice-admiralty courts. Salvage law tried to mediate the interests of owner and seaman by requiring the sailor to save all possible cargo and equipment in order to be eligible for wages after the sale of such goods. Seafarers often "w[i]th Great diligence & pains saved all of the greatest part of the Cargo" of their damaged ship, and they always seemed to know when salvage was "much more than sufficient to pay all the Wages due to all the Mariners." Whether these tars are motivated by fear of a greater catastrophe, or by a fear of going without pay, they are certainly working with "Great diligence." Illuminated by the fire and its reflection off the rippling waters, these tapawlins unload a small boat and haul the goods up the beach. They all wear round hats with narrow, upturned brims; jackets that end about the waist in blue, red, and possibly brown; and breeches. A couple of their mates shoulder their loads past a beached cutter, with astonished gentlemen looking beyond them to the blaze. 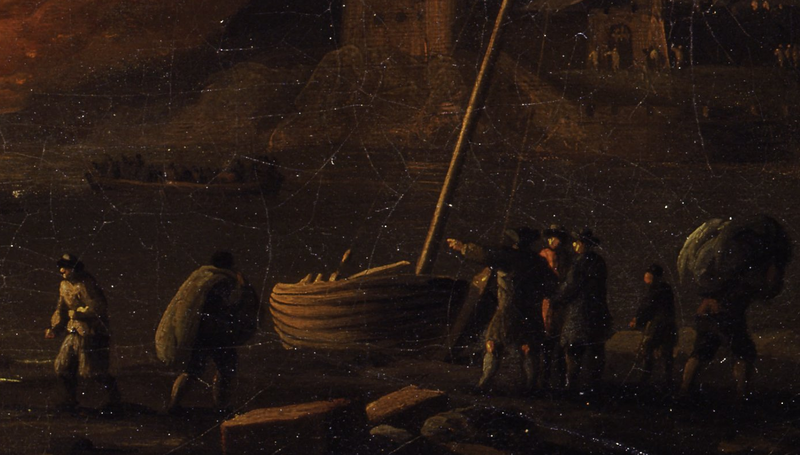 At the far left of this detail, another returns to the boat after depositing his load. The returning sailor might be wearing a smock, if not for the narrow cutaway at its center front hem. More likely, this is a sleeved waistcoat or single breasted jacket. He wears either a knit cap, beaver cap, or round hat, but the detail is too obscure to be sure. What we can say with more certainty is that he wears a pair of petticoat trousers that end just below the knee over black stockings. His mates wear jackets and dark breeches, with grey or white stockings.